One plausible approach to trying to understand the dynamics of this turn to the far right is to consider relevantly similar historical examples. A very interesting study on the history of Austria’s right-wing extremism between the wars was published recently by Janek Wasserman, Black Vienna: The Radical Right in the Red City, 1918-1938. Philosophy played an important role in the politics of inter-war Vienna, on both the right and the left. Othmar Spann was a highly influential conservative thinker who openly defended the values of National Socialism. On the left were Enlightenment-inspired philosophers who were proponents for reason and science. The pioneering analytic philosopher and guiding light of the Vienna Circle was Moritz Schlick. In 1934 Schlick was required to report to the Viennese police to demonstrate that the Vienna Circle was not a political organization (Black Vienna, 106). Schlick responded with three letters intended to demonstrate factually that the Circle was “absolutely unpolitical”. He defended a conception of value-free science, and maintained that the debates considered by the Vienna Circle were entirely within the scope of value-free science. But, as Wasserman points out, the doctrines of positivism and modern scientific rationality that were at the core of Vienna Circle philosophy were themselves politically contentious in the conservative intellectual climate of inter-war Vienna. It is also true that some members of the circle were in fact active progressive thinkers and actors. The most overtly political member of the Vienna Circle was Otto Neurath, who had been imprisoned for his participation in the Bavarian Soviet Republic in 1918. The rise of fascism in Austria was a violent history, including the 1927 police killing of 89 demonstrators (2) as well as the assassination of Moritz Schlick in 1936. Right-wing individuals and organizations were unleashed in attacks on progressives and socialists in Vienna, and the Austrofascist state (1933-38) was more than willing to use force against its enemies. The assassination of Moritz Schlick was a single tragic moment in this large historical canvas. Schlick was shot to death in the main building of the university by a right-wing student, Johann Nelböck, in 1936. The background of the assassination appears to have involved politics as well as personal grievances, according to a document titled “Philosophie der Untat”, drafted by Professor Eckehart Köhler in 1968 and made publicly available in the 2000s through Reddit (link). Köhler’s document is well worth reading. It was drafted in 1968 and printed by the Union of Socialist Students of Austria for distribution at a philosophy of science conference in Vienna; but the student organization then got cold feet about the claims made and dumped 2000 copies into the Danube River. The document was rediscovered in the 1990s. According to Köhler, Nelböck was influenced by reactionary Vienna philosopher Leo Gabriel. It is apparent that the scientific philosophy of the Vienna Circle was at odds with the conservative thought that dominated Vienna; in fact, after his pardon by the Nazi government after the Anschluss, Nelböck proposed to create an alternative to positivism that he named “negativism”. It is ironic that the violence against Schlick had to do with the philosophy of positivism rather than the political program of socialism. The University of Vienna had a shameful history during the Nazi period. Following the Anschluss the university expelled more than 2,700 faculty and students, most of whom were Jewish, according to Professor Katharina Kniefacz’s short history of these issues in the university (link). “Anti-Semitic tendencies culminated in the complete and systematic expulsion of Jewish teachers and students from the University of Vienna after Austria’s ‘Anschluss’ to the National Socialist German Reich in 1938” (6). Few were invited to return, and public contrition for these expulsions only began to occur in the 1990s. According to Kniefacz, anti-semitism within the university persisted for decades after the end of Nazi rule. And two rectors of the university who served without objection during the Nazi period are memorialized in the Main Building of the University (10). This history is still of great relevance in Austria today. The Austrian far right came within a handful of votes of winning the presidency in May 2016, based on a virulent anti-immigrant platform. And the country’s high court has now invalidated that election, preparing the ground for a second election later this year. 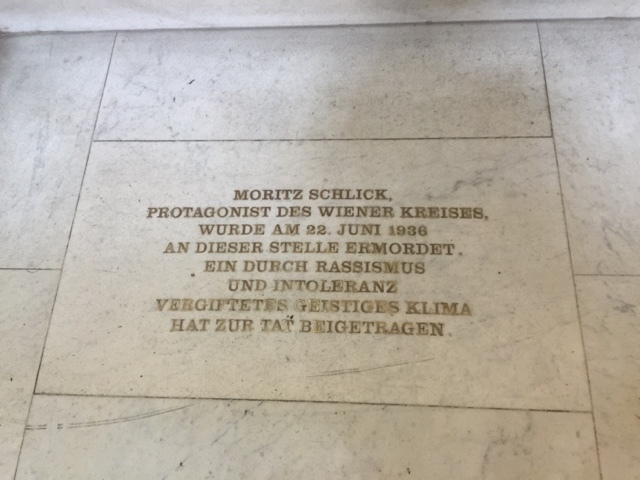 It is a very good question to wonder how widespread attitudes of racism, nativism, and anti-semitism are in the Austrian population today — the very climate of racism and intolerance mentioned in the Schlick memorial above.